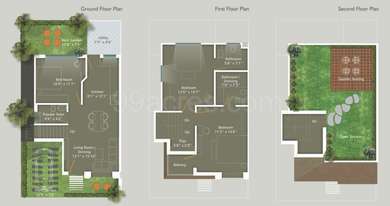 Lavish, is the only way to describe these beautiful 3BHK and 4BHK villas situated in Waghodia Road, Vadodara. Parkrest Villas built by Shashwat Infraspace have everything that you will ever expect in a true luxury accommodation. Extended over a wide area, its architecture and attention to detail, put them in a class by themselves. These homes are recognized by Gujarat RERA and is built with all essential amenities. In which area is Parkrest Villas located?The project is situated in Waghodia Road, Vadodara. How much is the total size of Parkrest Villas?The project is spread over an area of 12.6 Acres. What is tentative possession date of Parkrest Villas?The project is expected to be delivered by Dec 2026. Does Parkrest Villas have cricket pitch? The project doesn't offer a cricket pitch. Does Parkrest Villas have kids play area? The project doesn't have kids play area. Is there a club house in Parkrest Villas? The project doesn't have a Club House. Earthquake resistant RCC frame structure as per structural engineer design. Double charged 800x800 Vitrified Tiles in Lounge, Dining & kitchen. 605x605 Vitrified Tiles in all Bedrooms. Anti-skid Vitrified tiles of reputed make in bathrooms and balconies. Concealed copper wiring of approved quality. Branded premium quality modular switches with sufficient electrical point as per architect plan. Designer bathrooms with Premium Glazed Tiles upto Door level. Premium branded Plumbing fixture and vessels. Granite counter with Stainless Steel Sink and tiling upto the door/window level on walls. Doors : Elegant wooden entrance Door. Internal Flush doors. Windows : Colour anodized aluminium section windows with reflective glass of reputed make. Open terrace finished with chemical water proofing and china mosaic flooring/tiles. Recognized as one of the most trusted names, Shashwat Infraspace has created a distinctive reputation for itself in the real estate space of Vadodara. The company has delivered numerous projects, each of them being a testimony to the highest standards of quality and the expertise of the best professionals. It believes in delivering what it promises and has an enviable track record of building some of the prominent landmarks in Vadodara.